If there’s anything that causes us to evaluate our lives and think about ways we can improve ourselves, I suppose it’s the start of a new year. It’s a fresh slate, a time of beginning new habits, a chance to plan ahead. While I know I learned some lessons in 2016, I didn’t see, in hindsight, as much spiritual growth as I would have liked. As we’ve looked ahead to 2017, I discussed with my daughters ways we can grow in our spiritual life, hoping that we could all set goals for the coming year. We thought of seven areas we can concentrate on when we want to grow spiritually (in no particular order). With those ideas in mind, I thought about the next 365 days, and what I want to see happen in my life and in the lives of my family. I think the following three requests can be made by all of us, no matter how we hope to grow in the coming months. 1. Pray for God to order your steps. I actually have Sues to thank for this one! In a comment on a previous post, she said that this is a prayer she prays each day. I love this idea, as a daily prayer and as an overarching request concerning the way God will guide us in the year ahead. We know that God is in control of every aspect of our lives, that each circumstance that comes up is no accident, but a moving of His hand. He wants to grow and change us into His image, and to teach us to rely on Him as we recognize how much we need His help and power. I want to have a heart that is ready and willing to follow His plan without question, to submit to His will without complaining. It has to do with accepting daily “interruptions” as from Him, and allowing His schedule to supersede mine. I am definitely still a work in progress here! 2. Pray that you and your family will grow spiritually. I want to look back at the end of 2017 and be able to see concrete growth in my spiritual life. That may involve trials that I’ve come through with a greater understanding of God’s peace and grace. It may be a temptation I’ve overcome by God’s grace. It may simply be a habit I’ve mastered that’s allowed me to learn more about Him through studying my Bible. I think the best way to ensure that this will happen is to develop a plan. For example, since I’ve chosen prayer as a focus for the year, I’m getting back to writing out my monthly prayer list for my family (something I’ve not been doing for the last couple of months). I’m also following this Scripture writing program for January. Each day I write out a verse about prayer in my journal, and then meditate on that verse for the next 24 hours. Not only is it good to make a plan for ourselves, but we can also do it for our families. Maybe there’s a particular Bible study you want to do as a family – or you could choose a Bible character or a book of the Bible to dive into. Maybe it’s just reading a verse from Proverbs together each night and talking about what it means. Having a plan to grow spiritually doesn’t guarantee it will happen, but it does give us a better chance at success! 3. Pray that God will be glorified in all you do in 2017. We were created to bring God glory (Isaiah 43:7). How often I’m tempted to do things for my own glory, so that I will be recognized by others. This can affect my marriage and certainly my parenting. Maybe I want my kids to obey so that others will think I’m a good mom. I need to realize that God gave me these relationships to steward for Him, to raise my kids so that they will ultimately bring Him glory. If I’m seeking to bring God glory, then I’m living in humility. As I look at my goals for the year, am I using them to bring glory to Him? Will my body be a better temple if I eat healthier foods and exercise? Will I be a better wife if I set a goal to do something special for my husband every month? Will I know His word better and learn what actually glorifies Him if I get into my Bible every day? If our ultimate goal is to glorify God, we can apply that principle in every area of our lives. I pray that each of us will grow in our walk with God in 2017, that we might look back at the end of our year and see how He has guided us, and be able to give Him praise and glory for what is accomplished! What else are you praying for in 2017? Do you have a particular area of your spiritual life that you want to focus on this year? Thanks for sharing this, Nikki!! I'm going to check them out right now! Amen! Great prayer focuses. Praying with you this morning. Thank you, Heather!! Appreciate your taking the time to comment! I love these! My verse for the year is 1 Cor. 9:24-27. Verse 26 is my focus "Therefore I run in such a way, as not without aim; I box in such a way, as not beating the air". I am praying daily that my actions are purposeful and bring a result that brings praise to Him. No wasted actions! Thanks, Angela!! Love your focus verse for the year! Trusting that God will answer your prayer in a mighty way, and that you will see fruitful actions and God-honoring results in the coming weeks. Thanks, Sarah! Hope you have a great weekend!! I want to focus on being more intentional with #3 – I usually think afterwards how what I have done could bring Him glory, but I want to think about it before. 3 excellent things to pray for! Thanks for sharing on Grace and Truth. 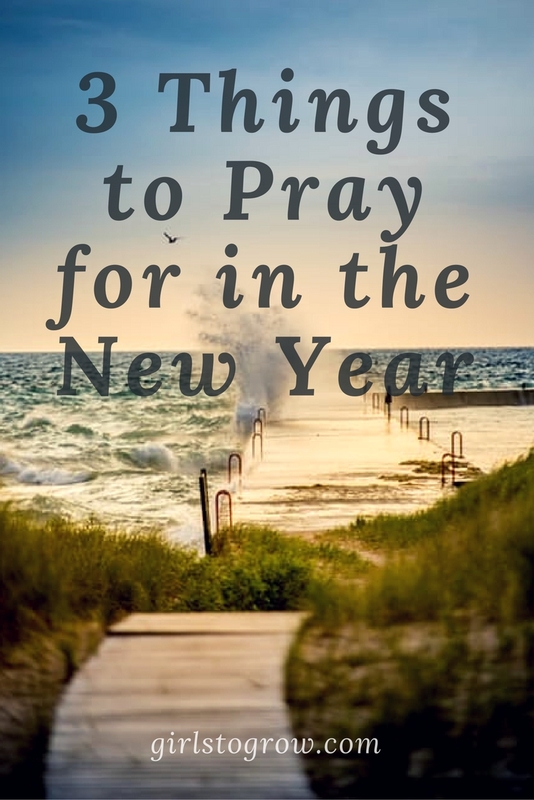 I am praying for more healing and more joy this year! Wonderful thoughts! Thank you for sharing at Living Proverbs 31! I will be sharing this post with my readers next week!